1 of 1 Combine 3 cups water, 2 cups red rice (such as Lundberg Burgundy) and 1/2 tsp salt in a lidded pot. Bring to a boil over high, then cover and reduce to medium-low. Cook 40 minutes. Remove from heat and let stand 10 minutes. Meanwhile, bring a small pot of water to a boil. Remove from heat and add 1/2 cup each golden raisins and sweetened dried cranberries. Soak 5 minutes, then drain. Whisk 1/3 cup cider vinegar, 2 tsp each grainy mustard and honey, 1/2 tsp salt and 1/4 tsp black pepper. While whisking, add 1/3 cup olive oil in a thin stream. Set aside. Place rice in a large bowl. 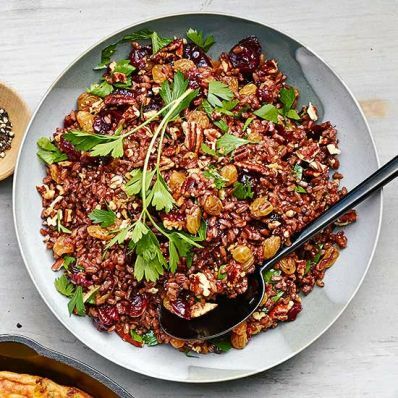 Stir in plumped raisins and cranberries, 1/2 cup parsley leaves, chopped, 1/2 cup toasted chopped pecans and the dressing. Per Serving: 2 g fiber, 44 g carb., 11 g Fat, total, 287 kcal cal., 244 mg sodium, 4 g pro.